We do it to ourselves and our friends; show love via food. We also do it to our pets. While Pilchard is just a big cat, she doesn't need to be big big, and Mija definitely doesn't need to be defined as big. I'm not the most mobile of people anymore and that's reflected in the lack of play time with the girls. I've been told to get them more active, that they are overweight. I need to clean the living room so there is space for jumping and catching and chasing. All part of the cleaning of my life and, therefore, is done in minute increments. One of the things I could do, my vet said, is go from a hard kibble diet to a canned food diet. There is a large push from many of the cat web sites I frequent, to have feeder people (I don't like the word 'owner', anymore. I kind of feel they own me, rather than me own them.) go to a homemade food diet, where you can control, precisely, what they eat and how much. Yeah, right. When I don't cook very often for myself, the girls would suffer, too. The thing we have learned is that there's too much grain in cat food. Yes, cats will eat grass. It's part of their diet in small amounts. Grains, however, were and are used to provide bulk and reduce the cost of the food. They are empty calories and have no real nutritional benefit to cats. Cats also must have taurine in their diet. Their bodies don't manufacture it. Without it in ample supply, a cat will suffer hair loss and tooth decay and will, eventually, go blind. A cat in the wild gets this amino acid from eating prey. House cats, whose only prey source is the mice that happen to blunder into the basement, must have good nutritional food. And, for the record, they have never, ever, eaten a mouse caught in the basement. They just leave it after it's dead and then look sadly at me. No getting taurine from those critters. Fortunately, thanks to advancements in understanding feline health, cat food has improved tremendously since we brought Shakespeare home, some nearly 30 years ago. There is a wide variety of good canned cat food out there so I don't feel the need to cook food for them. I can just open a can. I started feeding Merrick dry cat food several years ago. The girls really like it and it's 100% grain-free. 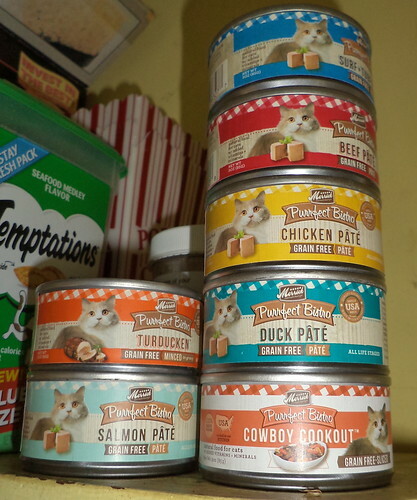 So, when my vet said I needed to add canned, the extra cost was tempered by the knowledge Merrick makes canned cat food. Throughout December, Petco had Merrick canned for a buck a can, if you bought 10 or more. I rearranged my budget and was able to purchase 40 cans at that price. The girls get half a can, each in the morning, before I head out the door for work. I refill the dry food in the dishes but I don't refill them during the day. If I sleep in, there have been days when the dry dish is completely empty when I get up. That's fine. They aren't going to starve. So far, they like every flavor except the "Cowboy Cookout". I get the "You expect me to eat this?" look. After several of those, I don't buy that type. Our other cats ate canned exclusively, only it was Fancy Feast. That brand has been reformulated to be lower in grain content than in the past. It's okay for the occasional treat, but for every day feeding, we're going with Merrick. I don't buy the large can because the girls don't like chilled food. I could feed them half a can in the morning and half a can at night but I'd have to warm it or leave it out to warm up to room temperature. I'd rather just pop a top and parcel it out. One of the funniest things happening now is they know mornings are for canned food. Mija follows me into the kitchen and meows when I get a can down from the shelf. Pilchard will sit in the living room and meow as she watches me serve up the food. Cats don't meow at each other. Meowing is reserved for us humans. Mija has always been a bit more chatty than Pilchard. Now, they both are. It's pretty funny. One aggravation is how Mija will take 2-3 bites of her food and then run to eat out of Pilchard's bowl. I keep saying, "Mija! It's the same stuff! Eat out of your bowl." I don't know what's prompting this. Pilchard does not growl, even when Mija sticks her head into the bowl. She usually gives up and wanders away. I don't know how to break Mija of this other than to feed her in a closed room. Do I know if it's working in the drive to slim them down? No, honestly, I don't. I do think it has helped Pilchard with eliminating hair balls. We had a spate, in November, where she vomited a hairball every 2-3 days. I wound up taking her to the vet because I didn't think this was normal. Giving them hairball remedy has been something of a joke. Since adding canned to their diet every day, I have had one hairball. I'll take that. If we develop dental issues, then I will go to an all canned diet. For now, this is what we've evolved into and it seems to be working okay. My pocketbook is lighter, that's for sure, as Merrick is not cheap, but I think I'm doing right by the girls and that's what matters.